English Country Garden is a garden that mimics the natural look of England’s countryside. The English countryside typically has wide fields of wild flowers and stone hedges. It is a picturesque scene, something that is similar to the gardens portrayed in fairy tales. Most people who have this type of garden theme for their gardens are people from Europe who have lived away from their home country. This design appeals to them as it brings memories of their younger years in England and it makes them feel closer to the land they left behind. This theme makes use of flowers and plants that are native to the English countryside. There are some varieties of plants and flowers that are unique to a specific area in Europe and if the recurring theme in those areas includes plants like those then it shall be done so in your very own English type garden. As mentioned earlier the English countryside has fields of wildflowers, so in English country gardens wildflowers are often incorporated. It also includes stone birth baths, fountains or benches as these are reminiscent of the stone hedges in Great Britain’s countryside. Some also build artificial ornamental ponds and gazing pools to complete the theme. It might also include a perennial border and usually it has a formal carpet bed that gives it a manicured look. The look is combination of planned color schemes and artful work. The look is a mesh of formality with a tinge of the wild countryside. The lines where the English country garden theme comes from may sound grand and well-suited if you are planning to design an estate’s garden. However, this also works for simple and smaller backyards as well. You can still have a stone ornament like a bird bath surrounded by a mix of perennials, annuals and bulbs that are typical to England’s countryside. This simple arrangement will bring a cozy English atmosphere in your backyard. What’s the Difference Between Formal and Informal English Gardens? An English country garden can either be formal or informal. An informal theme has a more cozy and homey feel. The formal version of an English country garden would be somewhere along the lines of a fairy tale garden. It is much grander and it would be more suited for manicured gardens of estates. The use of stone benches captures the look and still includes functionality as well. 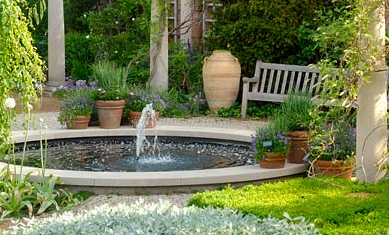 A stone hedge or bird bath or a fountain can also be incorporated as the focal point if the space is available to build a design upon it. You can also line picket fences or a brick wall along the borders and place an arbor where vines and shrubs could attach and grow. A carpet of green grass of course should not be forgotten. The English countryside is blessed with a lot of rainy days making their grass lusher. To achieve these in places where rain is not as abundant, there are draught-resistant plants that you can make use of. Before going into the whole design it is best to plan it first. Making a sketch will probably be a lot of help. Finding the right plants and ornaments will also take time. Have everything ready so your new garden will go smoothly.